The modern supply chain is complicated, to say the least. A variety of products from locations thousands of miles apart arrive at the same warehouse to be processed and shipped off to locations that are also thousands of miles apart. Keeping track of these products and finding slots that keep different product types separate and easily accessible can be a tall order for a warehouse manager. A deep lane storage system can make it easier to do all of these things. High-density storage not only maximizes slots for inventory by improving cube utilization in the warehouse, it also provides a discrete channel for each individual stock keeping unit (SKU). This helps keep SKUs separated and speeds up slotting, picking, and throughput. Deep lane storage is also one of the easiest storage systems to automate. However, using this type of setup can mean a trade-off in flexibility. Putting a deep lane storage system in place requires a significant investment in planning, equipment, and time, and it is difficult to alter as circumstances change. It’s important to take a careful look at both the pros and the cons to determine if a deep lane system is the best solution for your facility. Wasted Space: In traditional warehouse designs, a large percentage of a warehouse’s square footage is given over to access aisles, which represent empty space a company is paying money to maintain but isn’t getting a return on. 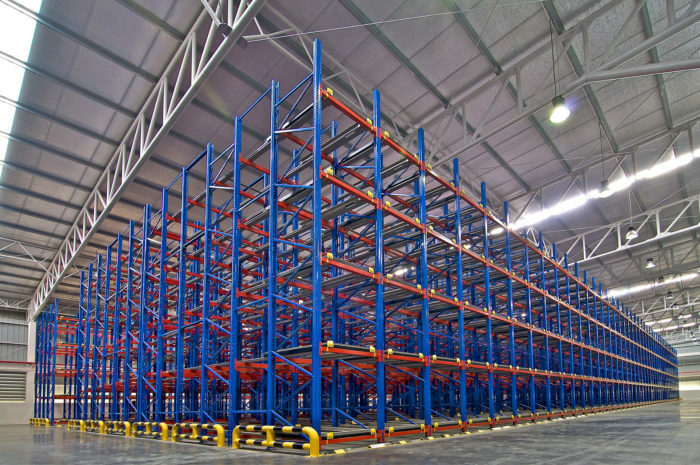 Consequently, aisles have shrunk in many warehouses to the point where they may pose a safety issue. Lost Inventory: Having access to all the slots in a warehouse makes it easy for hurried employees to place inventory in the wrong slot by mistake or as a short-term solution during a hasty unloading. This can slow down product picking later on, as employees may have to hunt down misplaced inventory to fulfill an order. Employee Safety: By their nature, traditional warehouse layouts tend to have safety issues. Multiple forklifts and employees may be moving around in the same aisle, making collisions more likely. Racks are often built up to the maximum height limit, and forklifts become less stable the higher they are raised. A forklift tipping over or dropping a pallet is a relatively common—and dangerous—occurrence in warehouses. Deep lane storage systems do away with aisles entirely, along with many of their issues. Pallets are introduced at one end of a continuous block of racks, and a pallet shuttle—also called a pallet mole—carries the pallet into the next open slot. This system increases the number of slots available per square foot and only requires forklifts at the input and output ends of the pallet racks. As a result, fewer forklifts are required and they have fewer opportunities to interfere with or distract each other. Deep lane storage offers many other benefits for warehouses as well. The first and most obvious advantage of deep lane storage is the high density of goods that can be stored in a relatively small area. This both maximizes warehouse space and makes organizing logistics channels—the complete network required to deliver products—easier. In today’s supply chains, each SKU—and each method of delivery—represents a channel. A consumer packaged good, for example, boxed cereal, has a channel that gets it from the producer to grocery retailers. However, if home delivery of that same cereal is also an option, then two channels are required in the same warehouse for the same SKU. In a world where omnichannel services—or offering all goods through all possible channels—is the goal, the ability to designate a lane for every channel might be the greatest feature of a deep lane storage system. Since a pallet shuttle moves from one end of the racks to the other more quickly than a forklift, deep lane storage enables higher throughput than other storage systems. Easy Automation: Deep lane storage systems are easily automated and easily integrated with other automated systems. The pallet shuttles used in deep lane storage are a form of automation, and fully automating the system is a matter of equipping each lane with a permanent shuttle and programming them to act autonomously. AGV Compatibility: The input and output zones of a deep lane storage system are fixed, reducing the area that Automated Guided Vehicles (AGVs) must navigate. This simplifies implementation of automated vehicles and opens up the possibility of other kinds of warehouse automation which can significantly reduce labor costs. Linear Throughput: SKU storage is linear in a deep lane storage system, and can only work in one of two ways. Storage is either on a First-In, First-Out (FIFO) basis with input on one side of the racks and output on the other, or it is a single-sided Last-In, First-Out (LIFO) system with input and output on the same side. Both systems make inventory fulfillment easier, as employees simply have to pull the next available pallet at the output regardless of the setup. Since a pallet shuttle moves from one end of the racks to the other more quickly than a forklift, deep lane storage also enables higher throughput than other storage systems. This combination of high throughput, easily managed multiple channels, and automation compatibility makes deep lane systems the obvious choice for busy warehouses and distribution centers. However, there are some potential disadvantages to a deep lane storage system. The first drawback to deep lane storage is scaling. While high-density warehouse storage systems can be scaled up, it is not a quick process. New racking must be installed, warehouse management software programmed, and automation tested. Installation of the expansion may disrupt existing operations while it is taking place. Nor does a deep lane storage system scale down. If a particular SKU experiences a large difference in demand over time, some lanes may sit empty or need to be designated for different SKUs, and this possibility must be accounted for in the planning stages. Warehouse managers considering deep lane storage should also keep in mind that this system does not allow ready access to areas within the racks. If something goes wrong with pallets or products in the rack, the only option is to pull all the product from the lane and all adjacent lanes in order to clean up or repair the issue. The high density and throughput of the system mean that doing this can be a serious disruption that costs time and money. Plastic pallets are an ideal shipping platform for a high-density automated warehouse. To minimize this potential issue, it’s important to have reliability at the load unit level. Broken pallet boards, loose pieces of wood, and nails that can damage product packaging or equipment are unacceptable in a deep lane storage system. Accordingly, one of the best ways to prevent a disruption is to choose a shipping platform that won’t break down and damage the system. Plastic pallets are an ideal shipping platform for a high-density automated warehouse. High-quality plastic shipping pallets have a unitized construction that doesn’t utilize metal fasteners that might come loose and damage machinery. And, since they’re consistent in size and weight, plastic pallets meet the tight tolerances of today’s automated systems. A plastic shipping platform is simply the best option for keeping a deep lane storage system working at peak efficiency. The iGPS pallet pool offers a durable and reliable plastic pallet that is ideal for deep lane storage systems. To switch to a rental pallet that helps you get the most out of your high-density warehouse, give our team a call at 1-800-884-0225, email a specialist at switch@igps.net, or visit our contact page.